The Dell Inspiron Chromebook 11 (3181) 2-in-1 is a little Chromebook that could, with a rugged design, multi-tasking capabilities and a longer than average battery life. The best part is that it will probably cost you less than what you pay for monthly utilities. When you’re used to a high-powered laptop that you can rely on for the most arduous of tasks, like video and photo editing, it’s hard to imagine how a Chromebook, especially a low-end one that will only set you back $250 (about £190, AU$350), could possibly be useful for anything other than playing mobile games, Internet browsing and streaming movies on Netflix. 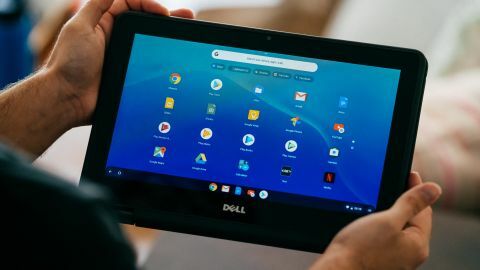 After spending a bit of time with Dell’s small but fierce Inspiron Chromebook 11 2-in-1, however, performing some minor productivity tasks and passing the time on games, we’re definitely starting to see the appeal of these laptop alternatives. That’s saying something considering that this particular Chromebook isn’t exactly the most high-powered on the market. Since the Dell Inspiron Chromebook 11 2-in-1 is so stripped down, it doesn’t come with a lot of customization options–only two in fact. One comes with 32GB eMMC storage and the other with 64GB, listed on the Dell site as $280 and $300, respectively. At the time of writing, they’re both discounted to the same price: $250. And while this laptop is available in its 64GB configuration in the UK at £319, it is unfortunately unavailable in Australia, where Dell only offers the 3185, a 2-n-1 loaded with Windows 10 and an AMD A9-9420e processor. The 3185 comes in two configurations: the cheaper (AU$600) comes with 4GB RAM and a 500GB hard drive, and the more expensive model (AU$700) has a 8GB RAM and 128GB eMMC storage. One of the main reasons to buy the Dell Inspiron Chromebook 11 2-in-1 is its compact body. At 11.96 x 8.18 x 0.82 inches, this Chromebook is so small you’d be hard-pressed not to find a place spacious enough in which to stow it. For its size, however, it is surprisingly heavy at 3.17 pounds and not as slim as we would like. To say that it’s an attractive device might be a bit of a stretch, what with that glossy, bizarrely reflective lid that makes it look more like a toy than a functional tool for adults. Yet, it isn’t unattractive either. We do like its textured keyboard deck with rubberized fringes and all-black look as well as its rounded edges. The membrane keyboard is actually decent with deep enough travel, enough spacing between keys, and keys that aren’t too stiff. As is the laptop’s trackpad, which is responsive enough for scrolling and tapping, although if you are a trackpad presser, you might find it a tad too stiff. The speaker is actually loud considering the size of the Chromebook, but the sound is tinny, there’s almost no bass, and the soundstage is very minimal. Beset by large bezels, the Dell Inspiron Chromebook 11 2-in-1 only offers a 1,366 x 768 display, wasting a bit of prime real estate. However, this display is a touchscreen, and boasts a night light option that you can adjust from cool to warm and schedule at a specific time. The 360-degree hinge is tight enough to hold different modes or set-ups, but not too tight that you’ve got to apply undue pressure to flip. This design allows four different use modes: the classic laptop design, tablet mode, tent mode and the stand set-up. Note that the keyboard automatically disengages while it’s in the last three modes. There is a decent number of available ports for a laptop of its size. Unfortunately, there is no USB-C, which is disappointing as that seems to be the direction most new devices are moving towards these days. Perhaps the best thing about this Chromebook’s design is that it’s supposed to be rugged. That is, it’s made to be splash- and impact-resistant, making it ideal for kids, travelers and users who are, let’s just say, more carefree.